Motorola One Power or Moto One Power is expected to be the next offering in the Lenovo-owned smartphone brand's mid-range segment, due for launch at an event on August 2 in Chicago. The Motorola One and Moto Z3 are also expected at this event. After having been leaked and been spotted in various instances in the past, a substantial leak has now surfaced just days before the Motorola One Power's alleged unveiling. As per the leak, the upcoming Moto-branded smartphone will arrive with a large 4,850mAh battery, a vertical dual rear camera setup, and up to 6GB of RAM. 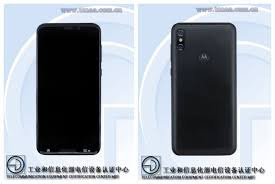 As is tradition, the Motorola One Power has made its way to certification portal TENAA in China. Colour variants listed in the TENAA database are Black, Gold, Silver, and White. Let's have a look at what all specifications have been detailed. As per the listing on Chinese certification website TENAA, the Motorola One Power will run Android 8.1 Oreo, and sport a 6.18-inch full-HD+ display with a 1080x2246 pixels resolution and an 18.7:9 aspect ratio. The listing does not show a display notch on the smartphone, however previous renders have pointed towards the presence of one. The phone is powered by an octa-core SoC clocked at 1.8GHz, possibly the Qualcomm Snapdragon 636. This is coupled with 3GB/ 4GB/ 6GB of RAM and 32GB/ 64GB of onboard storage. Storage will be expandable via microSD card (up to 128GB).